UK Precision Ltd has a strong background of providing a right first time, high quality service to our customers. We pride ourselves on being a reliable supplier and giving feedback to our customers throughout the prototype and manufacturing process. We are accredited to the highest quality standards and are proud that all our employees are highly skilled and flexible. We know that sometimes things are unpredictable, so we do our best to respond quickly when our customers need something pulling out of the bag – whilst ensuring that we maintain our quality standards. We believe that developing our business ensures that our customers always get the best solution possible – so we invest time and money in pursuing new technology and implementing best practice quality standards as a part of the way that we all work. 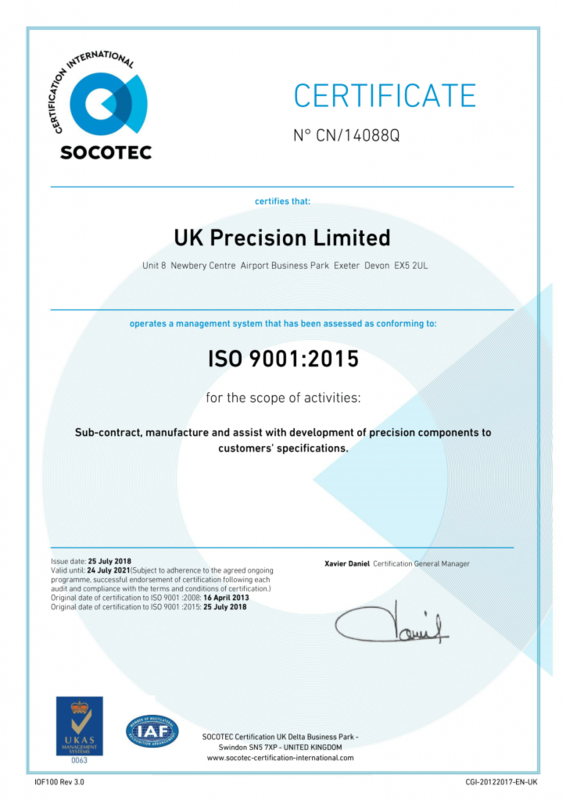 We are accredited to the ISO 9001:2008 Quality Management Standard, as well as other customer specific audit requirements. Throughout the production process, our regulated inspection procedures ensure complete ISO conformance and traceability. First off, batch and final inspections are performed by our experienced dedicated engineers. Click the certificate below to view the full Quality Management certificate (opens in a new window).